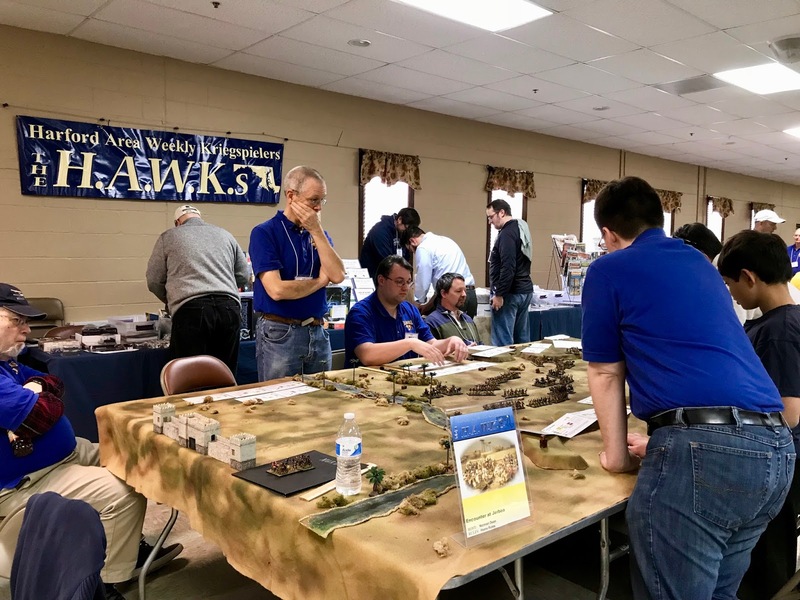 Photo Report of HAWKs BARRAGE 2-Day Convention for 2017 | H.A.W.K.S. 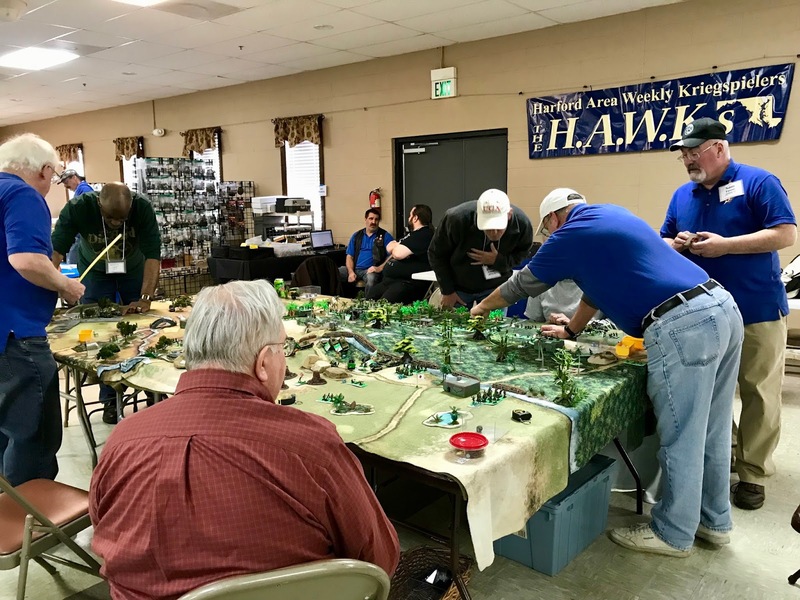 Chris Palmer This past Friday and Saturday, the HAWKs ran their annual BARRAGE gaming convention. 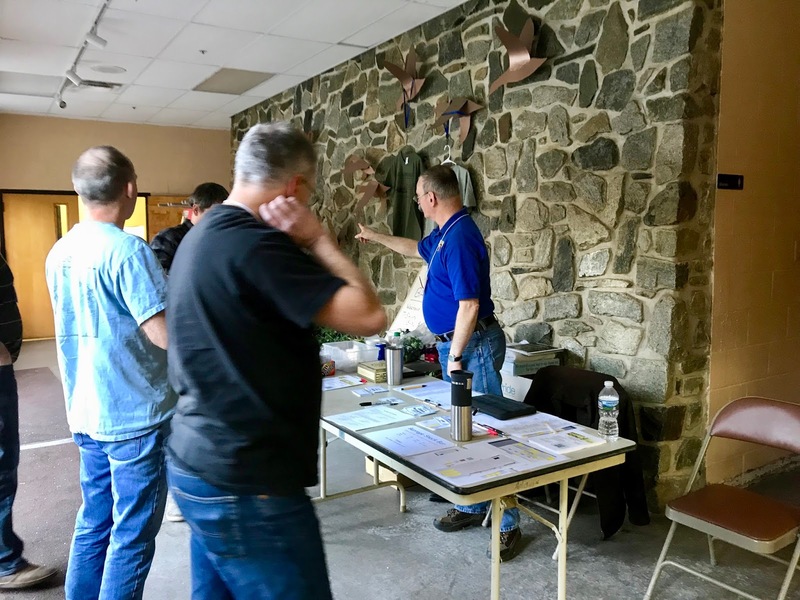 Because of a scheduling snafu, our usual late September/early October date was double booked in 2017, so we ended up having our 2017 convention in January of this year. 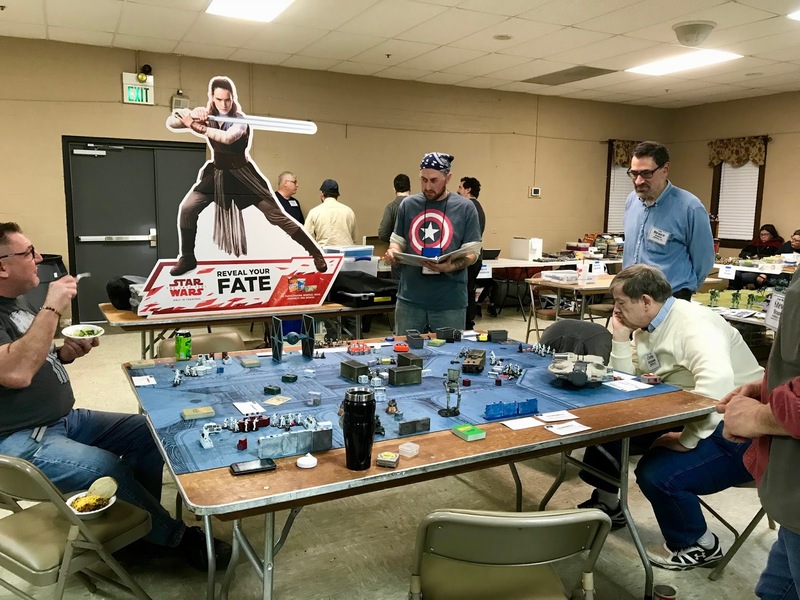 Despite the change of dates, we had a great crowd, a lot of wonderful games, and a wide variety of vendors. 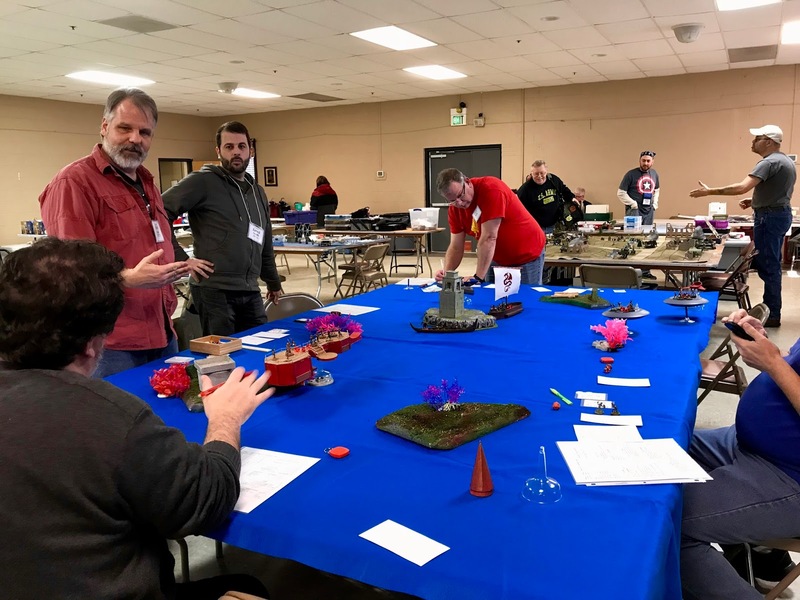 Brett Kite’s “Byzantines, Lombards, and Norman, Oh, My!” game, using Burn & Loot rules. 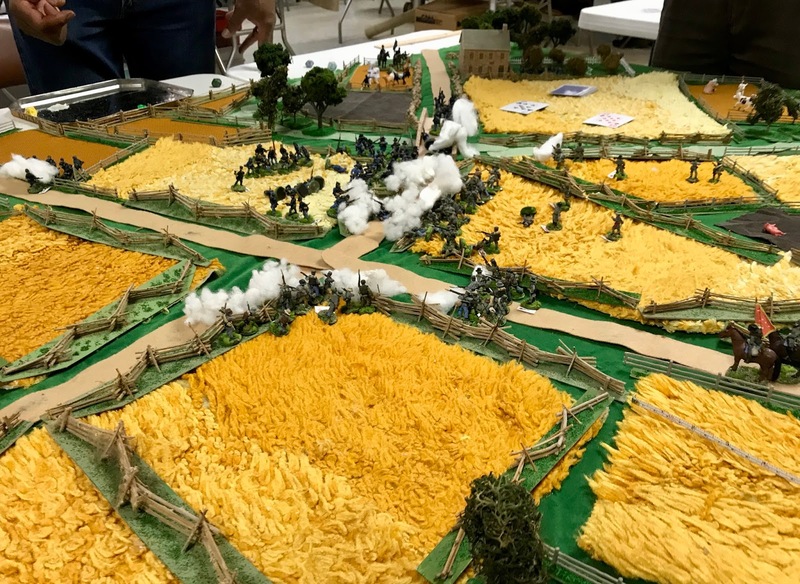 Dave Wood’s “Battle of Duivelskloof” Colonial era game, using the Colonial supplment to Combat Patrol rules. 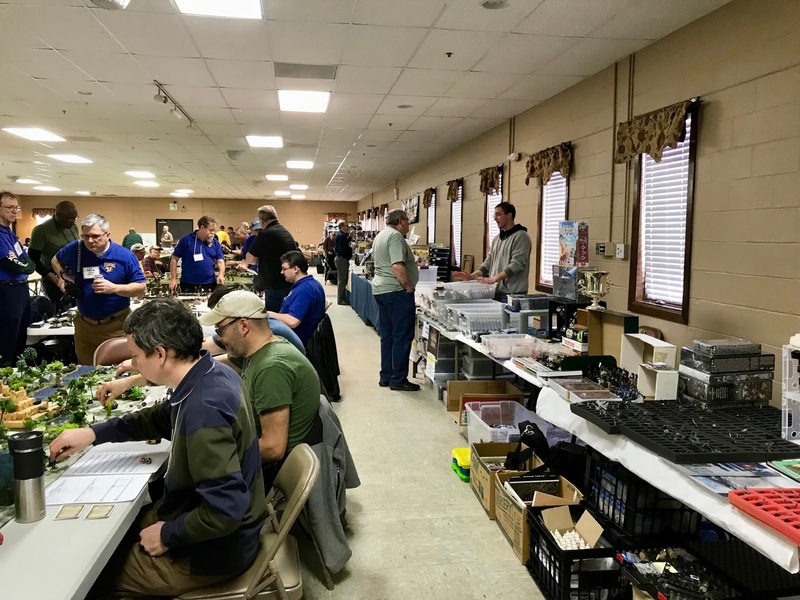 Our friendly registration desk was busy both days, welcoming first timers and old grognards alike. 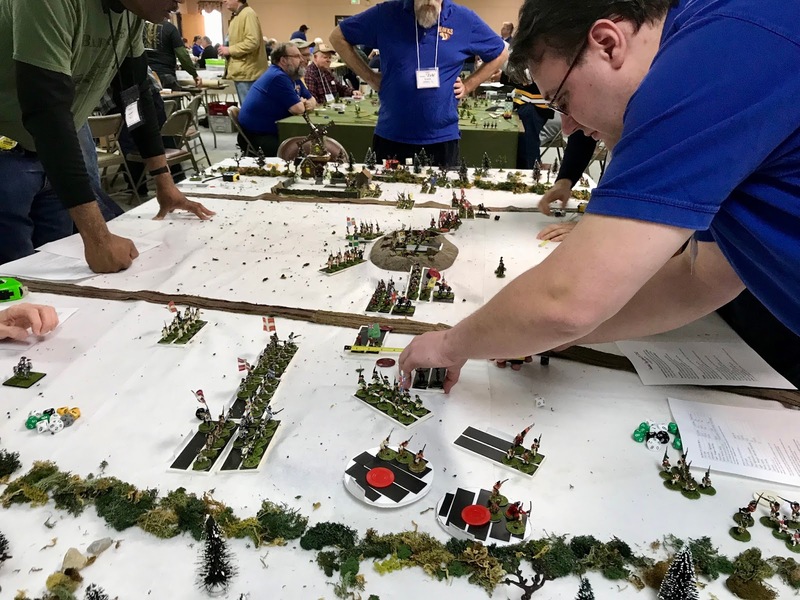 Kevin Fischer’s “Retreat from Jaburo” game using Mobile Suit Gundam rules. 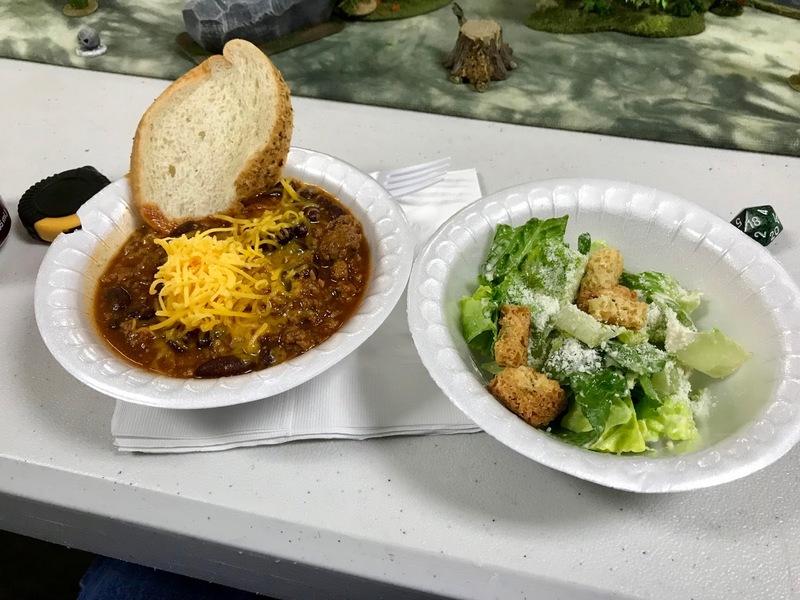 Good eats, including homemade chili and salad, were provided all weekend by the friendly staff of the Barrage Cantina. 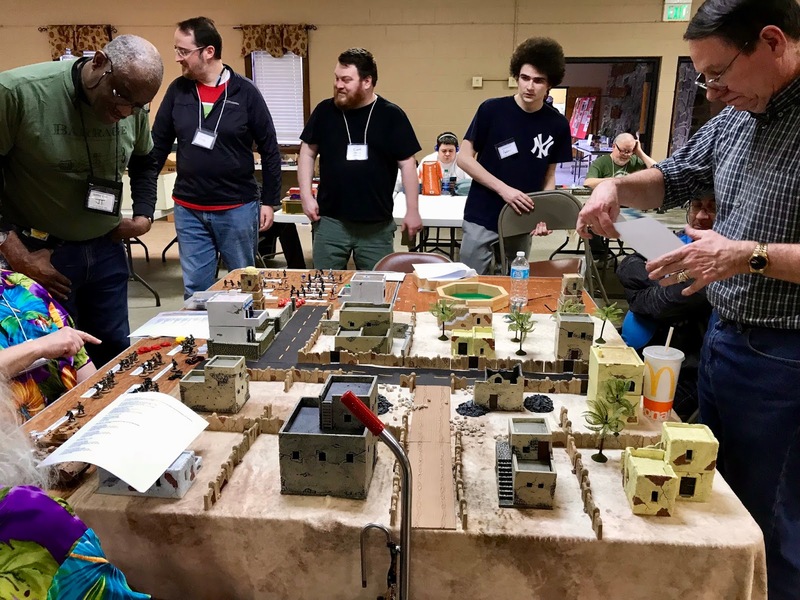 Greg Priebe’s “Star Wars: Combat Patrol” game using the Star Wars supplement to Combat Patrol rules. 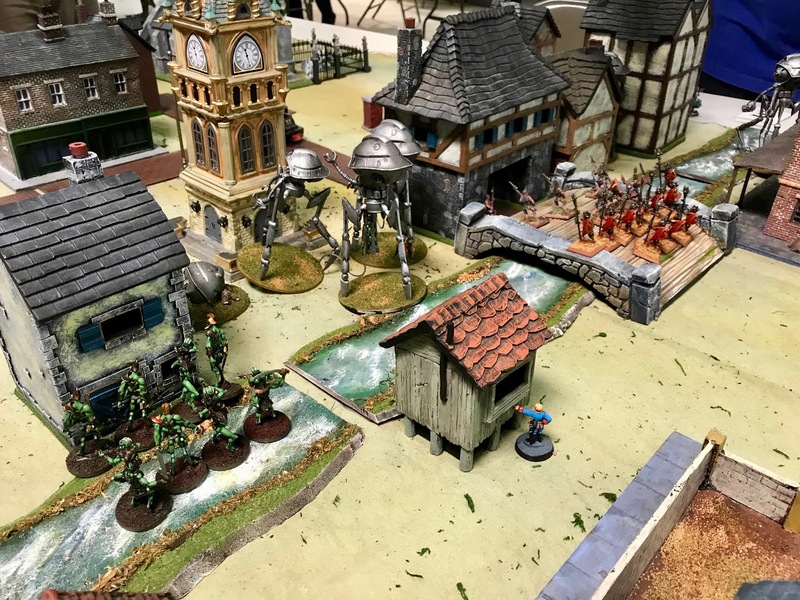 Zeb Cook’s “Mars Attacks, 1880’s Edition” game using modified GASLIGHT rules. 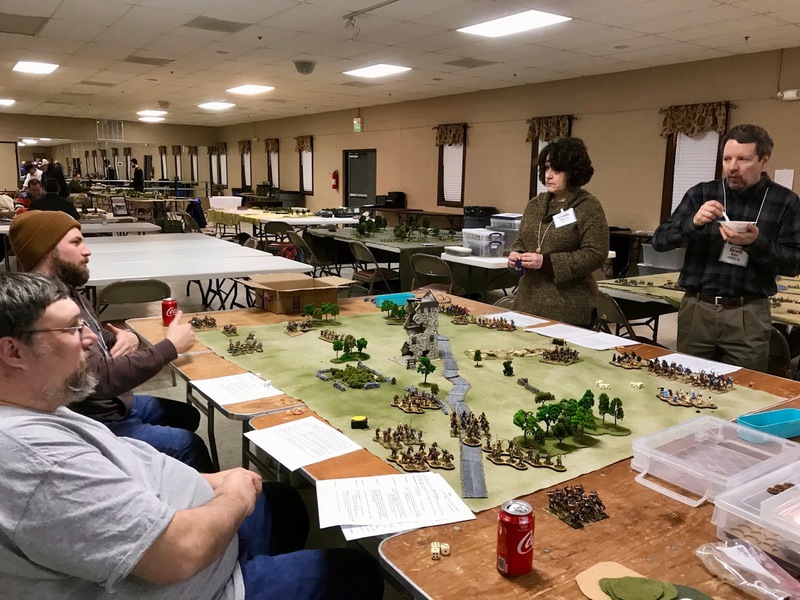 Bill Acheson’s “Panic in Pan Chaka, Part 2″ Tekumel game, using the Dark Ages and Fantasy Supplement to Combat Patrol rules. 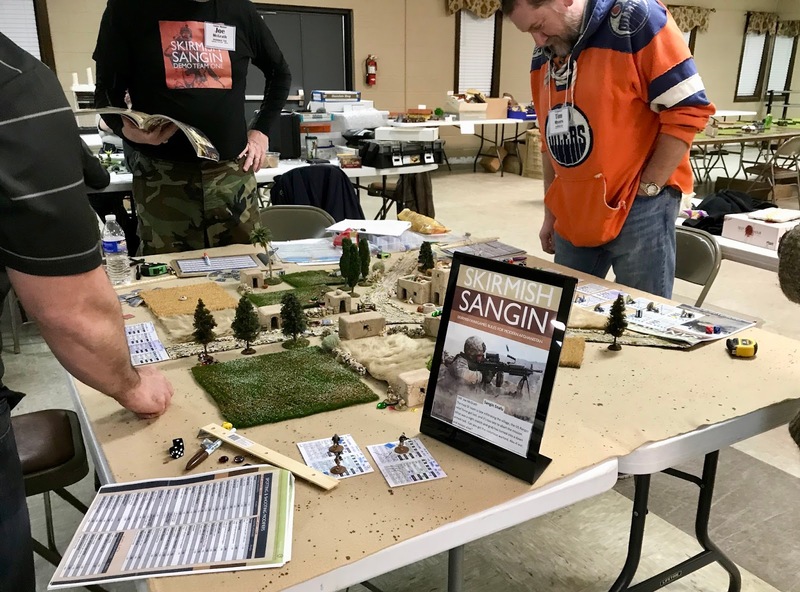 Joe McGrath’s “Sangin Snafu” game, using Skirmish Sangin rules. 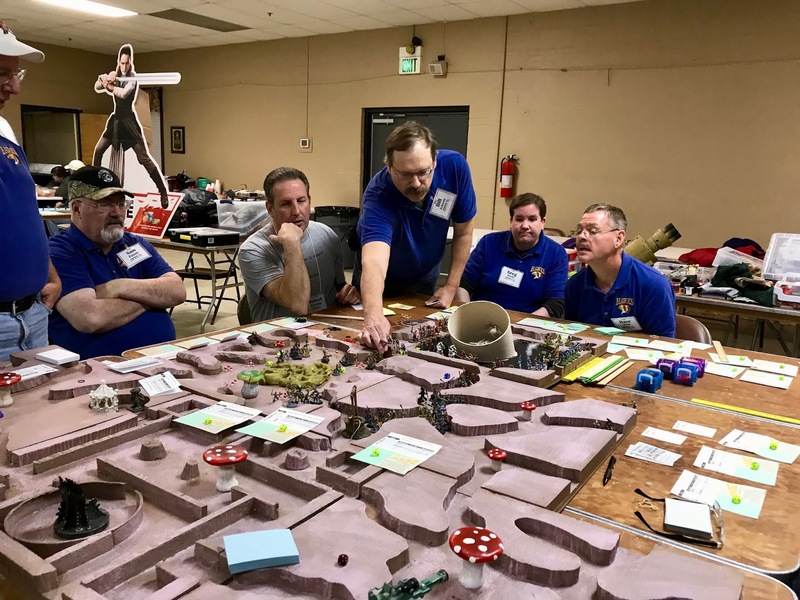 Steve Braun’s “Sea Kings of Mars” game using Savage Tales-Homebrew rules. A view of some of the vendors who ringed the outer wall of the community center. 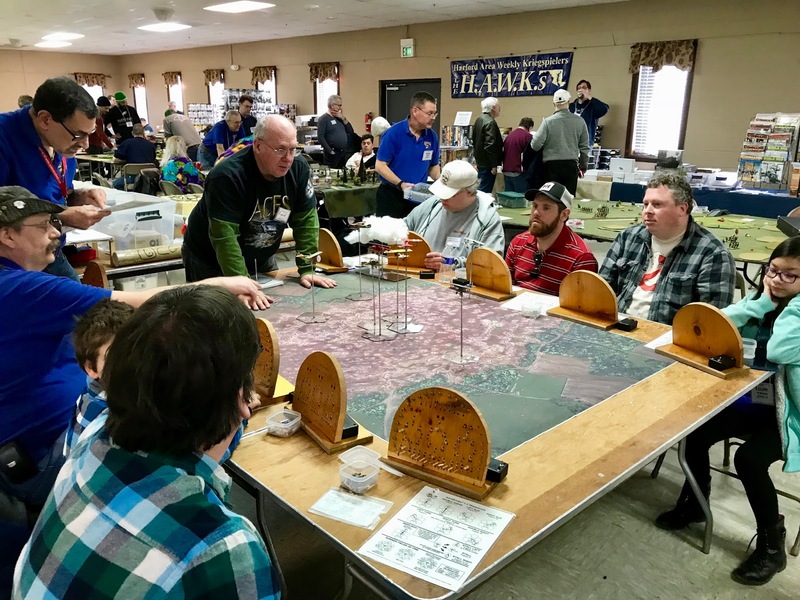 Rich Heffner’s Aerodrome game is a perennial favorite at the con with both kids and adults! 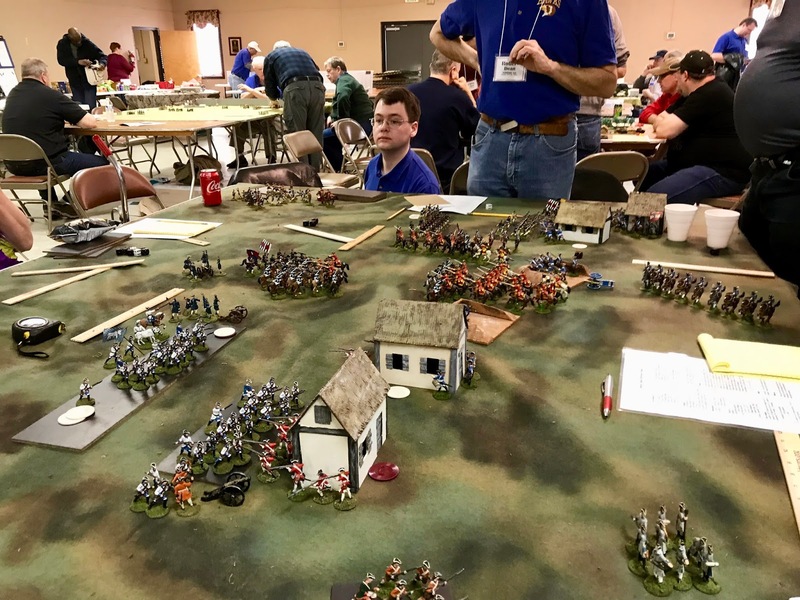 Daniel Erdman’s “Crisis at the Crossroads” game, using Brother Against Brother rules. 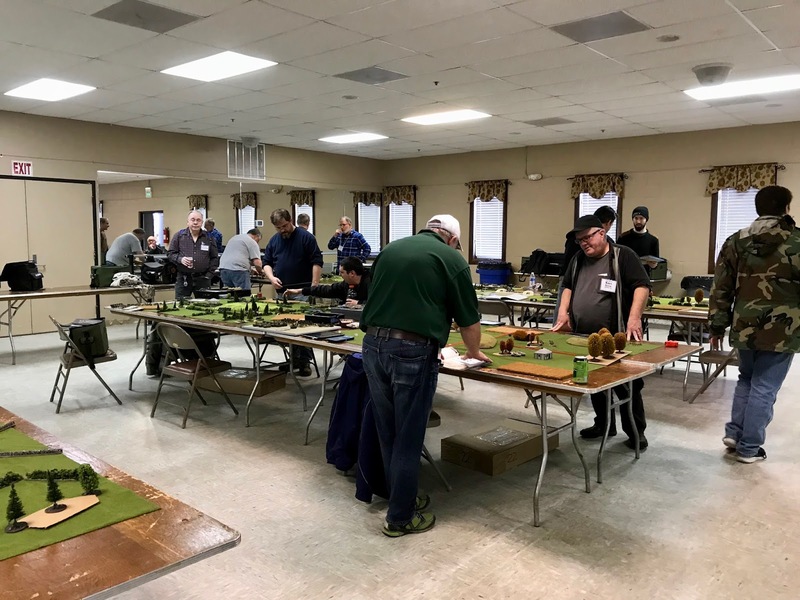 Brian Lipscomb’s “Operation Brevity, May 1941” game using Battlegroup rules. 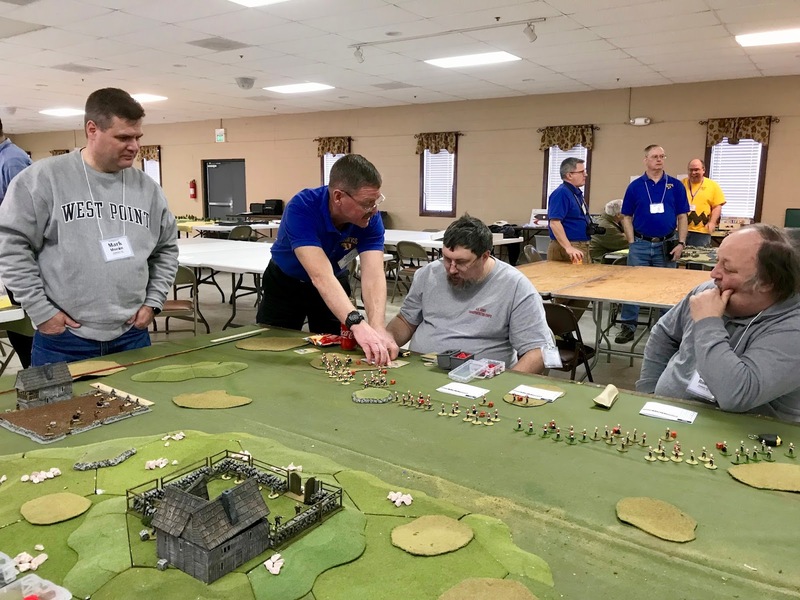 Both Friday and Saturday we had a busy Flames of War Tournament. 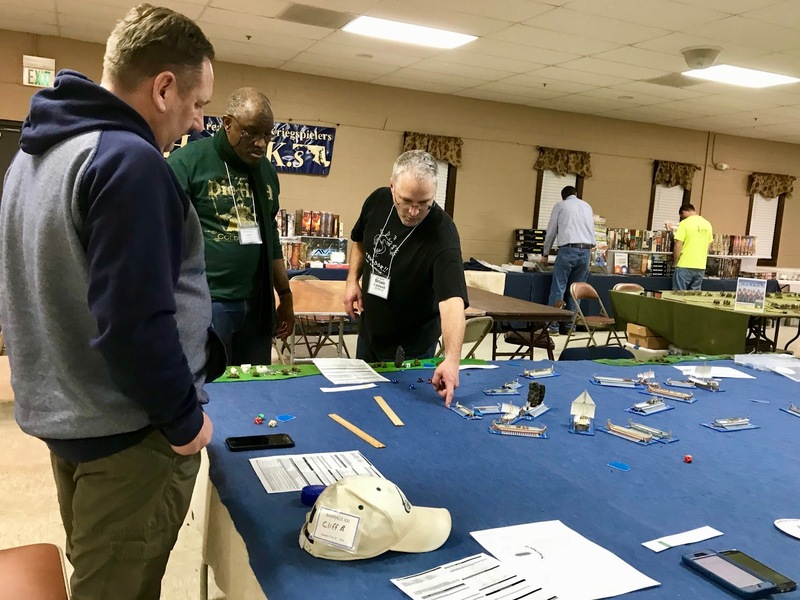 Michael Byrne’s “Highway 10” game using Force on Force rules. 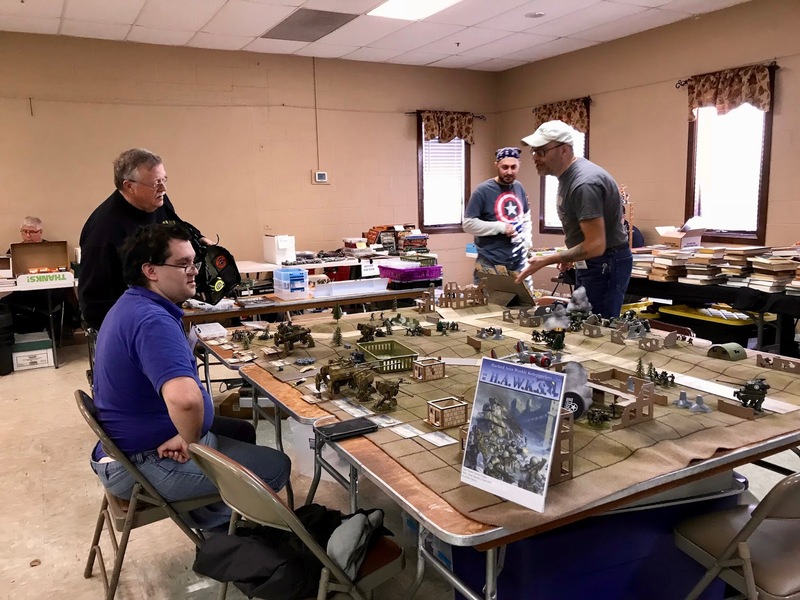 After the convention is over, it has become tradition for the club to hold a Pirate LARP, using Blood and Swash miniatures rules modified for LARPing. 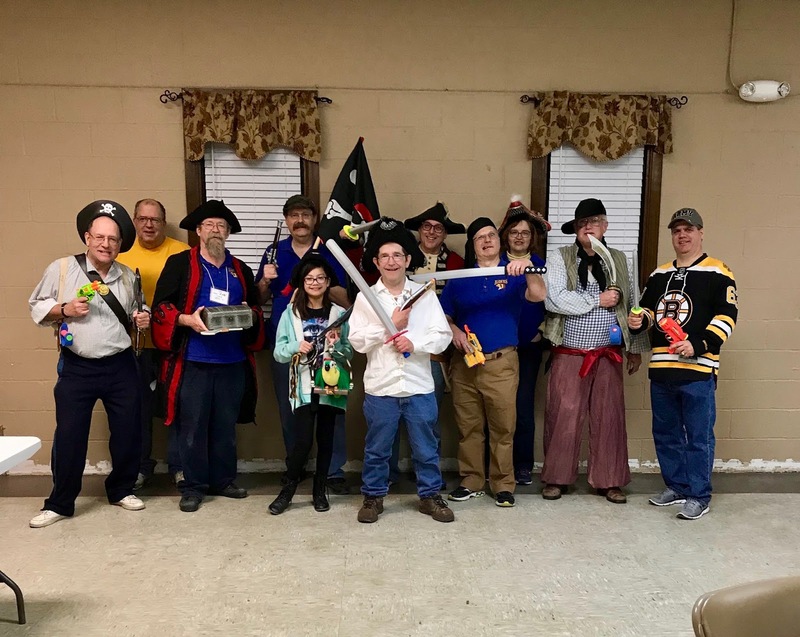 This year, club member, Bill Molyneaux, was declared the winner, and Pirate King of the Club, for successfully getting the Treasure Chest out of the “Tavern” despite stiff competition from his fellow dastardly scallywags. 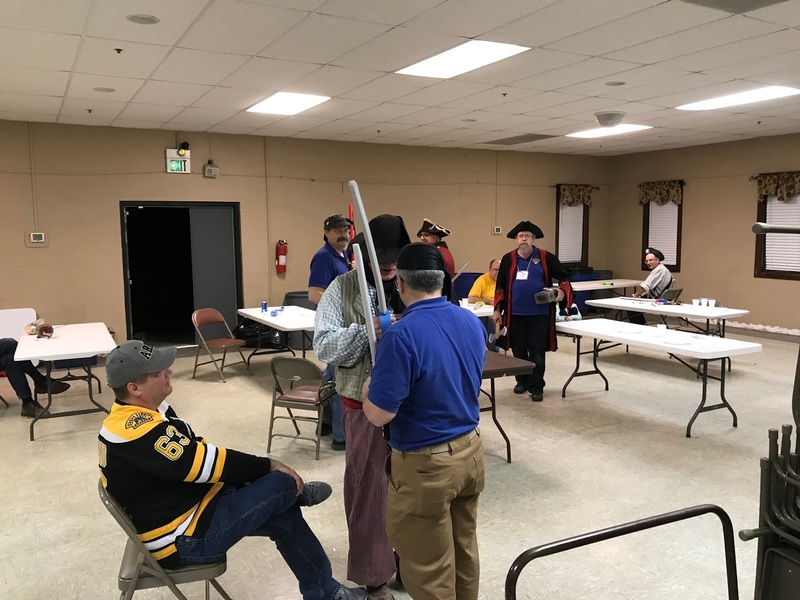 A long sword duel between Pirate Buck and Pirate Geoff. 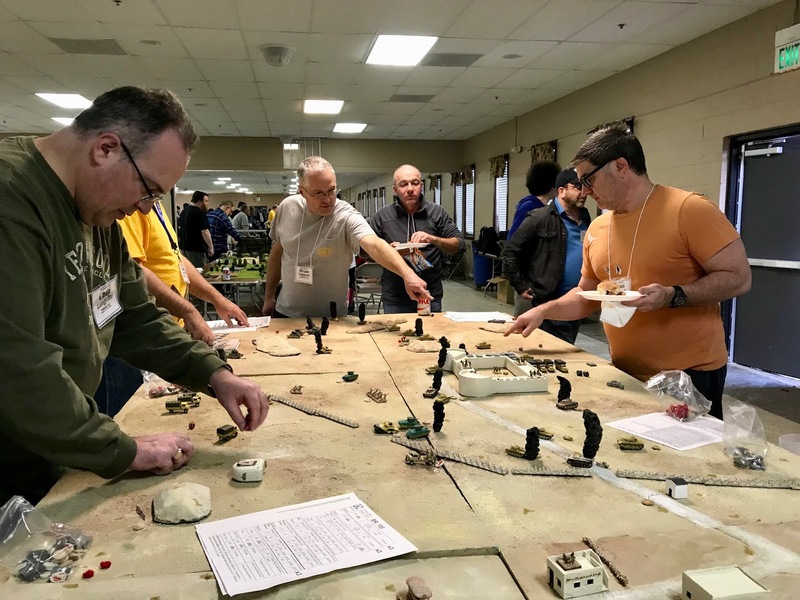 I plan to post a report in the next day or two on the pair of Ghost Archipelago games that I and Don Hogge GM’d Friday and Saturday, so be sure to come back to check those out. 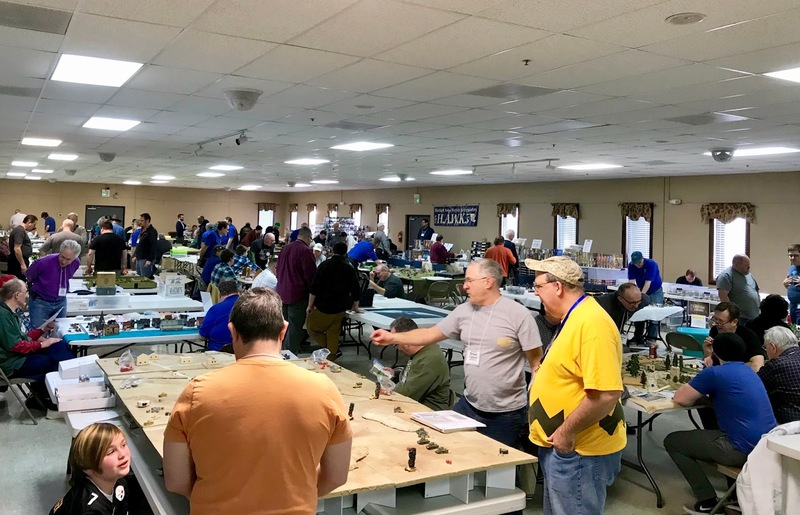 The club would like to thank everyone who came out this year; GM’s, Players, and Vendors, who all helped make this a great convention. See you all in September for Barrage 2018! Great BARRAGE! Thanks to all the HAWKS! It was great to see you again, Mark!